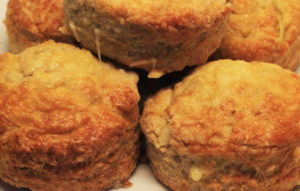 Our correspondent Grannie Kate sent these recipes for scones made with a flour mix that includes bere meal. Bere is a traditional landrace of barley grown mainly in northern Scotland but now confined to a few fields in Orkney. Find out more about the bere plant, its origins and its products, and also Grannie Kate‘s other recipes, at the links at the bottom of the page. 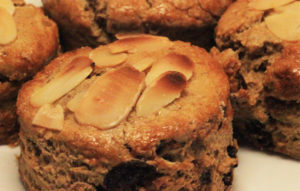 Bake for 12 – 15 minutes until golden brown with slightly singed almonds. Turn the dough out onto a floured worktop and make into a round about 1 ½ – 2 cm deep, patting it with your floured hand until smooth. Bake for 12 – 15 minutes until golden with the cheese on the top melting down the sides. More on the bere plant, its history and its products at The bere line -rhymes with hairline and Landrace 1- bere. More recipes using bere at Bere bannocks, Bere shortbread and Seeded oatcakes with bere meal. Many thanks to Grannie Kate for her recipes using flour (meal) from bere barley.